The American regional airline Skywest will open a new route for Delta Air Lines - Delta Connection, between Raleigh-Durham International Airport, North Carolina to Chicago's O'Hare Airport. 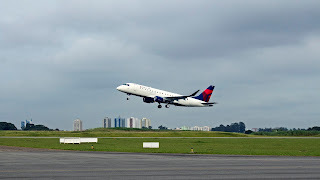 The route will start on 2nd April 2019 with Skywest Embraer E175 aircraft and is scheduled to operate three times a day, except for Saturdays, when only two flights each way will operate. According to the schedule, the flights will depart at 0700, 1230 and 1759 from Raleigh, arriving in Chicago at 0820, 1350 and 1919. The returns from Chicago are scheduled for 0855, 1425 and 1955 landing in Rayleigh 1155, 1725 and 2255. The last flight of the day is scheduled not to operate on a Saturday.